CARBONDALE, Ill. — New exhibits, shows, lectures and presentations are on tap for the 45th World Languages Day at Southern Illinois University Carbondale. After a two-year hiatus, the event, formerly known as Foreign Language Day, is back with more than 500 students registered to join the fun. Scheduled for April 4 at the SIU Student Center, the day works to expose high school students to language and culture in a fun and educational way. Reporters, photographers and news crews are welcome to cover the April 4 event, which begins at 9 a.m. and includes the Global Talent Show. The special exhibits and guest lecture at 3 p.m. on April 1 at Morris Library may also be of interest. For more information, contact Maria Bell at 618/453-5431 or mbell@siu.edu. The all-new Global Idol Talent Show is bringing a fun and entertaining element to this year’s event. The show allows individual students or student groups to highlight skits, poetry readings, songs and approved presentations in the language of choice. Each performance is limited to five minutes, with judging based on creativity, stage presence, audience response and fluency in the target language. First, second and third place winners will receive trophies at the conclusion of the contest. The excitement continues with virtual reality demonstrations set to help with the mastery of linguistics. With state-of-the-art Vive Pro Headset and accompanying equipment, students can experience language in a completely new way. Other activities include a Linguistic Puzzle Room, which offers an Egyptian themed escape room for students to try to crack. With support from the Craft Shop, students will find interesting artifacts to spice up the panic room. Students can also experiment with origami and Chinese paper cutting demonstrations. Additionally, the traditional “Your Name In” activity will be back, allowing participants to translate their name into languages such as Chinese, Japanese, Arabic and more. The information fair is ongoing throughout the day, allowing students to learn about a variety of campus departments. Some of the participating departments include languages, culture and international trade, linguistics, criminology and criminal justice, admissions, study abroad, law school and more. Learn to Dance Japanese Bonodori. French Chef! How to Make Two Delicious French Pastries. SALSA! Basic Steps with Demetri and Madeline. Bilingualism and Global Market (Aisin Manufacturing, Marion). Tapas: The Art of Snacking Well in Spain. Your Intercultural IQ: Are You Ready to Study Abroad? ZUMBA! A Mini-Lesson with Liz and her Latin Rhythms. A Quick Japanese Lesson (SIU Japanese Club). Navigating through Philippine Traffic: A Glimpse of Filipino Culture and History. Learning Malagasy in the Jungle: Exploring Madagascar. Can Animals Talk? My Experience with Signing Chimpanzees in Canada. ASL Song Workshop: "Where is the Love?" by The Black Eyed Peas. In addition to the World Language Day event, several exhibits and guest lectures are available through the month and highlight exceptional individuals from history. All exhibits and lectures will be at Morris Library, and are free and open to the public. The “World Languages in SIU Library Special Collections,” will feature texts from the medieval to present in Latin, French, Spanish, German, English, Swedish, Dutch, Quechua, Nahuatl, Japanese, Arabic, Urdu and Farsi. Presented by assistant professor of German, Jacob Haubenreich, this exhibit will include the Lord’s Prayer in seven languages, a page from the Gutenberg Bible and a miniature edition of Cervantes’ Don Quixote, among others. 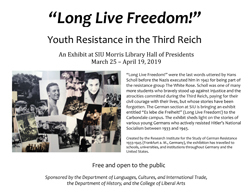 The “Long Live Freedom!” exhibit highlights youth resistance in the Third Reich, and is open April 1-19 at Morris Library. Created by the Research Institute for the Study of German Resistance 1933-1945, the exhibition travels to schools and universities throughout Germany and the United States. To accompany the exhibit, a free lecture from Sister Carol Marie Wildt, archivist for the School Sisters of Notre Dame and the Congregational Office of the Sisters of St. Joseph of Carondelet, is set for 3 p.m. on April 1 at the Guyon Auditorium. 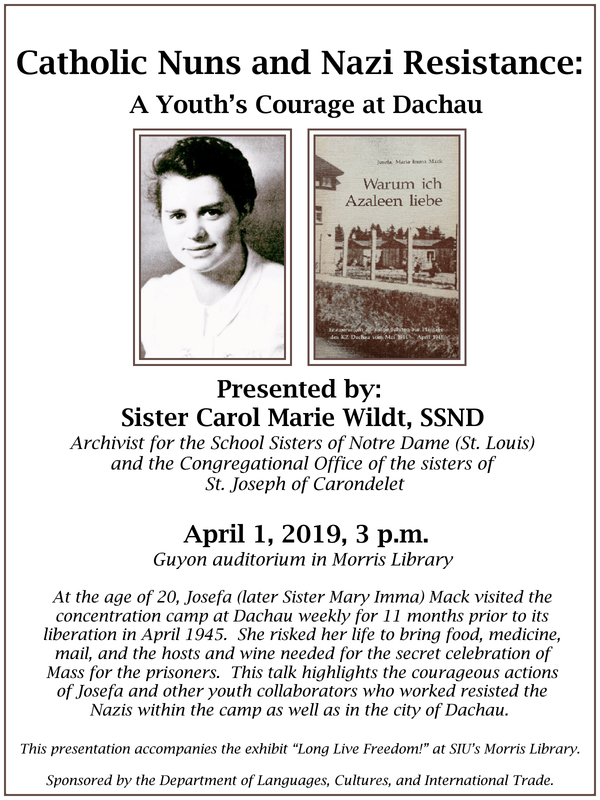 The lecture will highlight the courageous actions of Josefa Mack and other youth who risked their life to resist the Nazi regime. Hosted by the languages, culture and international trade department at SIU, all events are free and open to the public. 8:30-9:15 a.m. – Registration and information fair in Corker Lounge. 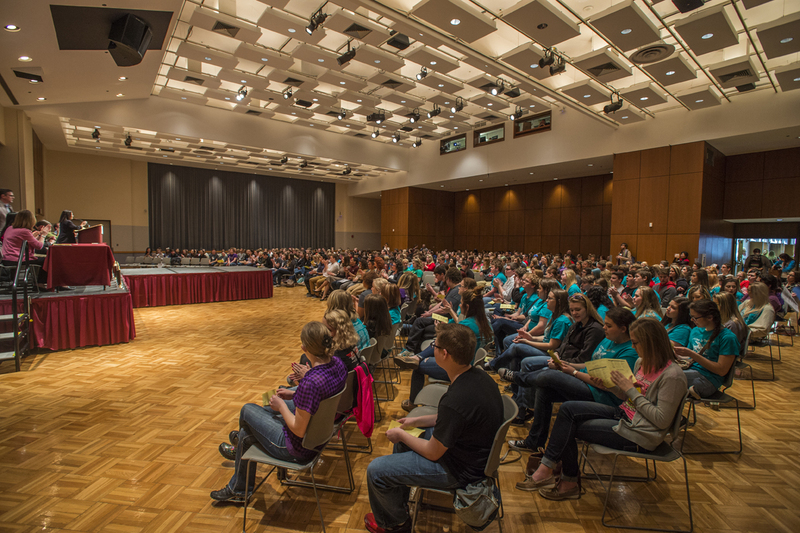 9:30-9:50 a.m. – Welcome Session in Ballroom D.
10 a.m.–12 p.m. – Cultural presentations, Global Idol Talent Show, exhibits at Morris Library, activities and information fair. 12:05-12:20 p.m. – Closing ceremony in Ballroom D.
For more information about World Language Day or the accompanying exhibits, contact Maria Bell at 618/453-5431 or mbell@siu.edu.